This application involved using an Impact PPT A20 camera for conveyor tracking that was integrated to a Yamaha RCX240 controller. 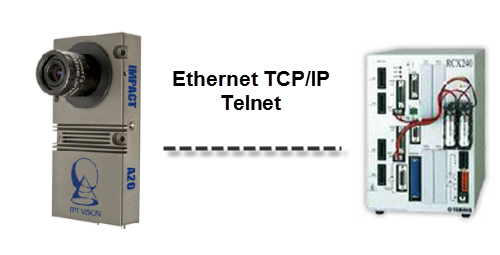 The camera was setup for Ethernet TCP/IP using a telnet server/client relationship. A Yamaha conveyor tracking board was installed in the RCX240 controller as a 5th axis, and the PPT camera was writing robot coordinate values in ASCII over Ethernet to populate the tracking que within Yamaha’s conveyor tracking que handler. Source code is provide that includes the PPT application file, Yamaha application file, some calibration PDFs, and pictures of the setup.